A series of comic books featuring superheroes who represent the virtues of Islam has gained a wide readership among young Muslims. The series is the brainchild of a Kuwaiti psychologist who sought to counter the influence of Islamic extremism among young people. “Muslim children need new heroes,” said Naif Al-Mutawa, the creator of the “99” comic book series. Al-Mutawa was the subject of a New York Public Television documentary that recounted the story about this first attempt to create popular cultural heroes in the Islamic world and how it has found gradual acceptance and popularity, even leading to a forthcoming animated series. The “99” refers to the 99 attributes of Allah taught in the Koran. The comic books portray 99 superheroes from around the world who each represent one of God’s attributes, such as generosity, strength, and wisdom, in the battle against evil. Al-Mutawa said that these virtues of God are those taught by all religions. He feared that a less positive view of Islam was gaining currency in the world. “There was a redefinition of religion after 9/11 [that] I didn’t want my kids to aspire to,” Al-Mutawa added. Then he heard about a Palestinian businessman who created an Intifada Album, selling children in the West Bank sticker books of suicide bombers. The albums included bloody scenes of terrorism and portraits of suicide bombers with captions extolling the virtues of martyrdom. In 2004, Al-Mutawa decided it was time to offer Muslim children and young people an alternative. Al-Mutawa sought investments from Kuwaiti banks and businesses to fund the publication of the comic books. Working with comic book illustrators and writers from the West, Al-Mutawa found modest success with Muslim youth, but also ran into obstacles with Muslim authorities and leaders in various countries. The documentary shows Al-Mutawa being challenged by Muslim university students in Indonesia about the “immodesty” of the characters of the superheroes and that some of the women do not wear head-coverings. Some Muslim booksellers criticized the 99’s identification of Allah with the human superheroes and refused to sell the comic books. Al-Mutawa argues that the comic books do not seek to portray Allah in human terms-something strictly forbidden in Islam-but rather show how the superheroes reflect God’s virtues. He has also insisted that the characters in the comic books wear loose-fitting clothes-a drastic change from the heroes of comic books traditionally wearing spandex tights. But the main obstacle to the 99’s success was the refusal of Saudi Arabian leaders to allow the comic book into their country. Without access to the wealthiest Muslim nation, Al-Mutawa’s dream of animating the 99 for the world’s Muslims was unlikely to materialize. With the investors unhappy, Al-Mutawa had to lay-off the writers and illustrators for a period and regroup. It was only after he secured financing from an Islamic investment bank in Bahrain that the 99 has become a wordwide phenomenon. The Islamic financing opened doors to Saudi Arabia and the worldwide media market. 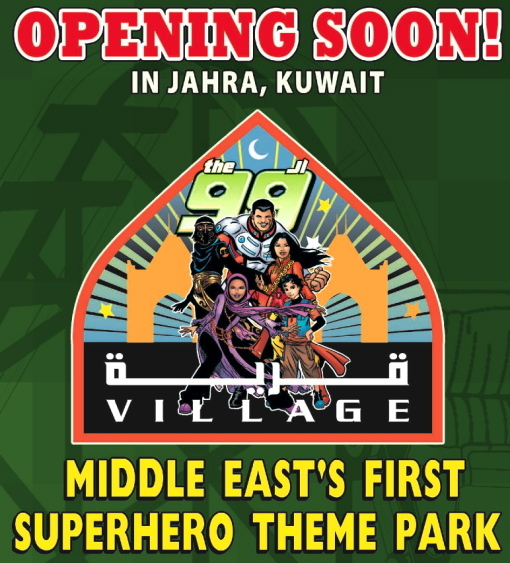 A 99 theme park has been started in Kuwait and the European broadcasting company Endemol has agreed to produce the animated series. The 99 TV series is a truly global enterprise; it will be written in Hollywood, have its pre- and post-production in Britain and be produced in India. The series will begin broadcasting in Europe, the Middle East, and Australia in 2012. In the U.S., a cable network had purchased rights to broadcast the 99 animation, but then a New York Post columnist charged that the series would engage in “Muslim indoctrination.” The network subsequently postponed the broadcast and there are no future plans to air the series in the U.S.